WIFC at the Onalaska Gun Show Tomorrow and Saturday! If you live in the Onalaska, Wisconsin area, we have some exciting news! The Wisconsin Firearms Coalition will be coming to the Onalaska Gun Show March 17th (Friday) and March 18th (Saturday). The show is being held at the Onalaska Omni Center, which is located at 255 Riders Club Rd., Onalaska, Wisconsin. This is a fantastic gun show in Northwestern Wisconsin — put on by the Bob and Rocco Gun Show Team — and it’s always well stocked with guns, ammo, gear and more. The Wisconsin Firearms Coalition will be there Friday from 3-8 p.m. and all day Saturday. Please note, we will not be there on Sunday. I hope you’ll stop by and get involved in our effort to pass Constitutional Carry right here in Wisconsin. Our political insiders tell us that the draft of Constitutional Carry is nearly complete. With 12 states now having Constitutional Carry as law, it’s time for Wisconsin to get on board! Just last month New Hampshire joined the Constitutional Carry club. There is no reason northeastern states, like Maine and New Hampshire, should be beating Wisconsin in the gun rights battle. Gun grabbers continue to try and stop these pro-gun efforts and they keep failing! Despite Donald Trump winning the Presidency, and anti-gun legislators being defeated across the country, we must remain vigilant in pushing substantive pro-gun legislation and defeating anti-gun legislation. Constitutional Carry is so important that we are traveling all over the state to attend these gun shows and find more gun owners willing to mobilize in these efforts! While you’re at the gun show this weekend, you can join the Wisconsin Firearms Coalition and pick up a free T-Shirt and a free decal! Joining the Wisconsin Firearms Coalition is a great way to show the politicians in Madison you aren’t asleep when it comes to fighting for gun rights. You are wide awake and fighting back! Additionally, if you’d like to volunteer during this show for a 4-hour time slot, the Wisconsin Firearms Coalition will pay your admission to the show and give you a free WIFC T-Shirt! You can volunteer Friday evening, Saturday morning, or Saturday afternoon. To get involved, click the link here and someone from our office will call you right away. P.S. 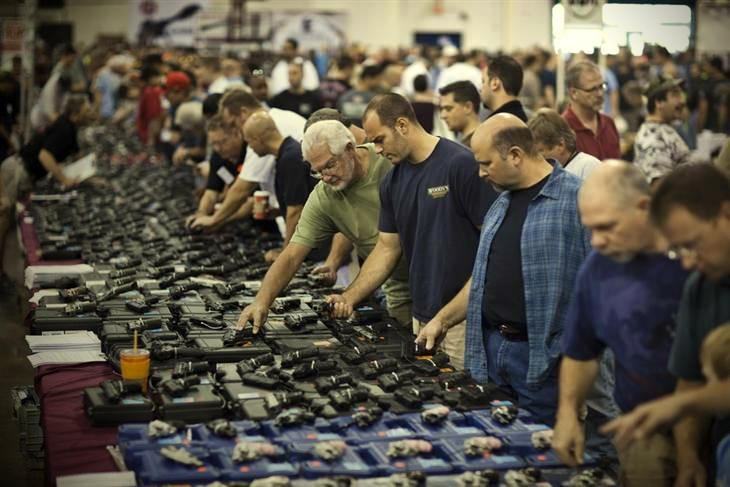 The Wisconsin Firearms Coalition will be at the Onalaska Gun Show this weekend, on Friday and Saturday! Come on out and get involved in our fight to pass Constitutional Carry in Wisconsin! And if you can volunteer for 4 hours, we’ll happily pay your admission to the show and make sure you leave with a free WIFC T-Shirt. Click the link here to get involved. While you’re there, don’t forget to sign the petition to pass Constitutional Carry for Wisconsin citizens! Come Out and See Us at the Eau Claire Gun Show! Constitutional Carry Filed in Wisconsin!